Former American UN Ambassador John Bolton says ICC has no legitimacy - warns a Clinton administration would give it some. Former United States Ambassador to the UN John Bolton has predicted that if Hillary Clinton becomes president, she will sign the US up to the International Criminal Court at the Hague. 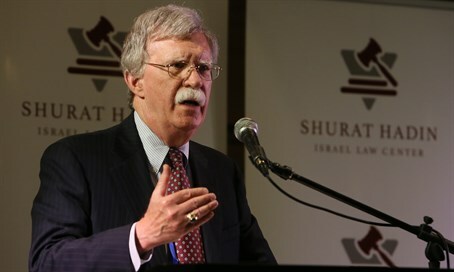 Speaking at Shurat HaDin's "Towards a New Law of War Conference" Monday, Bolton delivered a typically scathing critique of the current White House's foreign policy. "Iran learned that if it waits long enough the Americans will give up, remove the sanctions and do whatever they want," Bolton said, attacking the Obama administration's policy of appeasement towards Tehran. "International sanctions against state sponsors of terrorism are not meaningful, since they're always removing them." Turning to the ICC, Bolton called on democratic nations not to engage with the court, branding it unaccountable, illegitimate, impotent and biased. "We must not cooperate with the ICC - that gives them legitimacy," he said. "The ICC is an illusion. A bunch of people in black robes will never be able to stop the brutal dictators who carry out mass murders." "No one elected them, there are no checks and balances. It is in practice an ad hoc tribunal to attack African leaders," he continued, adding that his "happiest moment" in service of the US government was the day he removed America's signature from th Rome Statute. "Fortunately, Obama didn't resign until now, as he knows he won't have a majority in the Senate in favor," Bolton stated. But "if Clinton is elected, she will rejoin Americans to the ICC and resign the Rome Statute," he warned. Bolton also accused commentators and leaders of perverting international law for their own ends. "Most things which are considered 'international law' aren't law at all. They don't have any democratic legitimacy," he said. "This harms the sovereignty of states and is fixed by people who weren't elected by anyone."